When Grayson Hall was a child, her mother told her she experienced a supernatural visitation. Hall’s parents were separated, and she was living with her mother in Philadelphia. In 1970, Grayson told The New York Post: "One morning I found [my mother] sitting on the couch, with a full ashtray. I asked her what was the matter. She told me my father's mother had walked in at five in the morning and said, 'I've come to say goodbye, and tell you I'm sorry about what happened.' Later that day, my father called to tell me his mother had died during the night." Mitch Ryan's wife was played by Allyn Ann McLerie in the 1976 TV movie The Entertainer. Among Allyn’s many roles in classic TV shows, she played Carmen, the wife of radio station head Arthur Carlson (Gordon Jump) on WKRP in Cincinnati from 1979 to '81 and Molly's mom on The Days and Nights of Molly Dodd (1987-91). David Selby and wife Chip ran a summer children's musical theatre in New York for 10 years before moving to Los Angeles. David has directed numerous programs with kids and has volunteered with scouting and youth sports' programs. Dan Curtis made a two-hour TV movie version of Dracula in 1973, starring Jack Palance as the blood-sucking count. Carolyn Groves (pictured above) played Vicki for three episodes in January 1969, when Barnabas visits her in the past. Throughout the 1970s, Denise Nickerson was a busy child actor. Besides getting to hang out at Collinwood, she guest starred on the Brady Bunch, was a regular on The Electric Company, and starred in a few movies including Smile! (as young Miss San Diego) and Willy Wonka & The Chocolate Factory. She retired in hear early 20s. Ruth Warrick, who played the wife of Langley (Louis Edmonds) on All My Children, recalled Louis' successful audition when I interviewed her in 1995. "There were five different people [auditioning for the role]," she said. "Auditions are not exactly comfortable for anybody. But Louie was so much the gentleman, of course, as he always is. He was amusing, and it seemed that we got more humor out of the scene. It wasn't a humorous scene, but it just came to click and that just seemed to be the way it was." Diana Millay's dramatic turn in the jungle had several working titles: Tarzan, Brazil; Tarzan, Spain; and Tarzan and the Big River. The final title was Tarzan and the Great River. Donna McKechnie played Amanda Harris, also known as Olivia Corey, on Dark Shadows in 1969. On the NBC soap Another World, years later, there was a character named Amanda Corey. "The first time I was really aware of the immense popularity of Dark Shadows was a while after the show started," she said. "I had some time off and was going to Rome to visit my boyfriend who was a photographer and was on assignment for Time magazine in Rome, and he was going on to Africa, so I wouldn't see him for a while." "I happened to tell Joel Crothers at rehearsal that I was going to Rome and he asked what flight and what time I was leaving and so on. I told him. I went home after the show and I packed. And the doorbell rang, and there was Joel with a suitcase packed and he said "I'm coming with you." Joel and I flew over together, and when we went into the lounge at the airport, heads started turning. In the airport and on the flight over, people were talking about Maggie and Joe running away together. So that was the first time that I was really overwhelmed." "Then later I joined my boyfriend in Africa on a camera safari. He was again shooting for Time magazine. We were photographing a pride of lions feeding on a wildebeest, just outside of Nairobi. A land rover came up next to us -- this was 4:30 in the morning—and this little girl said, 'Mommy, mommy, there's Maggie Evans!' So there were a couple of instances that were so surprising, just so incredible." In her autobiography, The Bennett Playbill, Joan Bennett described life on the DS set: "Crewmen stand around just out of camera range, but always within the sightline of the actor; they stretch, yawn, walk around, scratch and mutter, and once I thought I was getting a cue to elongate a scene when a technician gave out with a splendid yawn and stretched his arms in a wide arc." Nancy Barrett and Jonathan Frid served as judges for The Miss American Vampire Contest, as part of the promotion of the film House of Dark Shadows. Regional competitions had been held in 10 cities. The final competition took place at the Palisades Amusement Park in New Jersey. Contestants dressed in creepy costumes. "It was a particularly odd experience," Nancy once told me. "One of the girls stood in front of me and said, 'Am I supposed to smile at your or something?' I said, 'No, that's all right. You can move to the next judge.'" The winner was Christine Domaniecki. Her prize was a non-speaking role on DS. In episode 1126, she played a barmaid. • Jonathan can be seen picking his nose, thinking he's off-screen, in episode 635 (1968). • The closing credits of DS were usually run over a static shot of a room used on that day's episode. During the credits for episode 703 (a shot of the Collinwood foyer), Jonathan walks across the screen in a contemporary outfit, carrying his costume draped over his arm. Just over five-foot-tall Diana Davila told The Daily News she took advantage of her size. "I exploit it," she said. "I make people protective of me." Baragrey had played the part in summer stock, but as he later told a reporter, since he'd only played it for a week, he'd forgotten the lines almost immediately. For the first few performances, he carried a script, in full sight of the audience. "Nobody was ever in such an advantageous position," he said later. "No matter what I did wrong, they were all with me." The actor's last-minute substitution saved the show, and garnered him an appreciative telegram from the mayor of New York, which he attached to his dressing room mirror. Dan Ross was a guest on the David Letterman Show in the late 1980s, discussing the fact that he was one of the most prolific novelists of modern times. Also on the episode was country music star Dolly Parton. Using his wife's name, Marilyn Ross, as a pen name, Dan wrote all 32 Dark Shadows novels released by Paperback Library in the late 1960s and early '70s, as well as the novelization of House of Dark Shadows and literally hundreds more Gothic novles, plus short stories and plays. Jonathan Frid and Ben Cross are the best-known Barnabases, but one other popular actor played the part briefly in 1988. Julian Stone, later a star of General Hospital, was cast as the melancholy bloodsucker in an off-Broadway production of Dark Shadows. Click here to read about that production. The capers at Collinwood would lend themselves well to a cartoon, so at one point, Dan Curtis Productions considered creating a Dark Shadows animated series. It was envisioned in the style of then-popular Batman Beyond, which, though set in the future, had a decidedly Gothic tone. Like many proposed series, the Dark Shadows cartoon did not get past the proposal stage. Jerry Lacy's wife, Julia Duffy, played the pampered rich girl turned hotel maid, Stephanie, on CBS’ long-running sitcom Newhart. Lacy worked as a writer on the comedy series and guest-starred. A stern-looking Grayson Hall is pictured in the Scholastic Inc. novelization of That Darn Cat published 1965. In the Disney film, Grayson played a kidnapped bank teller. Anthony George was pictured on the cover of TV Guide several times while he starred on the detective series Checkmate from 1960 to '62. He played the lead detective on the show, which was an upscale Perry Mason-type series featuring lots of prominent guest stars, including Anne Baxter, Milton Berle, and Tina Louise. Kathryn Leigh Scott's company, Pomegranate Press has published many Dark Shadows books, including The Dark Shadows Movie Book (1998), with the original shooting scripts for both DS films; The Dark Shadows Collectibles Book (1998), which I wrote; and Shadows On The Wall (1995), Art Wallace's 1965 "bible" for the series with projected storylines and character descriptions—many of which were greatly altered before actually appearing on the air. Kathryn has tapped many of her former co-stars to write chapters for her books, including Alexandra Moltke, Lara Parker, Jonathan Frid, Kate Jackson and Donna Wandrey. The Dark Shadows newspaper comic strip series featured supernatural stories -- such as a romance between Barnabas and the Egyptian goddess Isis, and several other characters from the TV show, including Carolyn and Elizabeth. Only Barnabas was drawn to resemble his TV portrayer. 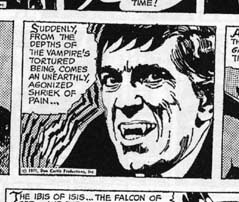 Many panels of the strip are obviously based on familiar promotional stills of Jonathan Frid in his vampire makeup. In fact, the likeness was so distinctive that Frid considered suing over the use of his image. Click here to read more about the DS comic strip. As Barnabas and Beth, Jonathan Frid and Terry Crawford did a TV commercial pitching the Milton Bradley Barnabas Collins Dark Shadows Game in 1969. Terry's other commercials included spots for Diet Mazola and Lysol. Jonathan didn’t do any more commercials, aside from some promotional spots for Dark Shadows when it was syndicated on PBS. David Henesy played a kid named Jerry on the November 15, 1973, episode of The Waltons, titled "The Thanksgiving Story." Writer Joanna Lee won an Emmy for the script of this special two-hour episode, which mixes drama and humor as John-Boy (Richard Thomas) undergoes surgery to preserve his eyesight after an accident at the local sawmill, and brother Jason goes to work for the seemingly prim and proper Baldwin sisters, and finds himself making moonshine! Superman: The Movie star Christopher Reeve had a small, uncredited part in the 1975 David Selby sci-fi TV movie The Norming of Jack 243. In 1955, DS director Lela Swift directed a TV production of Little Women on Studio One. In 1933, 22 years earlier, Joan Bennett starred in the film version of this Louisa May Alcott tale, along with Katharine Hepburn. Joan played Amy; Katharine was the plucky Jo. 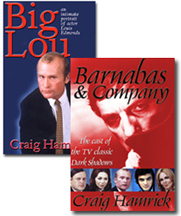 For many more stories about the Dark Shadows cast, read Barnabas & Company, available on Amazon.com.